Not to be confused with Alan Richman. Rickman's first cinematic role was as the German terrorist leader Hans Gruber in Die Hard (1988). He also appeared as the Sheriff of Nottingham in Robin Hood: Prince of Thieves (1991), for which he received the BAFTA Award for Best Actor in a Supporting Role; Elliott Marston in Quigley Down Under (1990); Jamie in Truly, Madly, Deeply (1990); P.L. O'Hara in An Awfully Big Adventure (1995); Colonel Brandon in Sense and Sensibility (1995); Alexander Dane in Galaxy Quest (1999); Harry in Love Actually (2003); Marvin the Paranoid Android in The Hitchhiker's Guide to the Galaxy (2005); and Judge Turpin in the film adaptation of Stephen Sondheim's musical of Sweeney Todd: The Demon Barber of Fleet Street (2007). Rickman gained further notice for his film performances as Severus Snape in the Harry Potter series. Rickman made his television acting debut playing Tybalt in Romeo and Juliet (1978) as part of the BBC’s Shakespeare series. He later starred in television films, playing the title character in Rasputin: Dark Servant of Destiny (1996), which won him a Golden Globe Award, an Emmy Award and a Screen Actors Guild Award, and Dr. Alfred Blalock in the Emmy-winning Something the Lord Made (2004). Rickman died of pancreatic cancer on 14 January 2016 at age 69. His final film roles were as Lieutenant General Frank Benson in the thriller Eye in the Sky (2015), and the voice of Absolem, the caterpillar in Alice Through the Looking Glass (2016). Alan Sidney Patrick Rickman was born into a working class family in Hammersmith, London, on 21 February 1946. He was the son of Margaret Doreen Rose (née Bartlett), a housewife, and Bernard William Rickman, a factory worker, house painter and decorator, and former World War II aircraft fitter. Rickman was of Irish and Welsh descent. His father was Catholic and his mother was a Methodist. Rickman had two brothers, David and Michael, and a sister, Sheila. When Rickman was eight years old, his father died of lung cancer, leaving his mother to raise him and his three siblings mostly alone. According to Paton, the family was "rehoused by the council and moved to an Acton estate to the west of Wormwood Scrubs Prison, where his mother struggled to bring up four children on her own by working for the Post Office." She married again in 1960, but divorced Rickman's stepfather after three years. Before Rickman met Rima Horton at age 19, he stated that his first crush was at 10 years old on a girl named Amanda at his school's sports day. As a child, he excelled at calligraphy and watercolour painting. Rickman attended Derwentwater Primary School in Acton, and then Latymer Upper School in London through the Direct Grant system, where he became involved in drama. After leaving Latymer with science A'levels, he attended Chelsea College of Art and Design from 1965 to 1968 and then the Royal College of Art from 1968 to 1970. His training allowed him to work as a graphic designer for the Royal College of Art's in-house magazine, ARK, and the Notting Hill Herald, which he considered a more stable occupation than acting; he later said that drama school "wasn't considered the sensible thing to do at 18". After graduation, Rickman and several friends opened a graphic design studio called Graphiti, but after three years of successful business, he decided that he was going to pursue acting professionally. He wrote to request an audition with the Royal Academy of Dramatic Art (RADA), which he attended from 1972 until 1974. While there, he supported himself by working as a dresser for Sir Nigel Hawthorne and Sir Ralph Richardson. After graduating from RADA, Rickman worked extensively with British repertory and experimental theatre groups in productions including Chekhov's The Seagull and Snoo Wilson's The Grass Widow at the Royal Court Theatre, and appeared three times at the Edinburgh International Festival. In 1978, he performed with the Court Drama Group, gaining roles in Romeo and Juliet and A View from the Bridge, among other plays. While working with the Royal Shakespeare Company (RSC), he was cast in As You Like It. He appeared in The Barchester Chronicles (1982), the BBC's adaptation of Trollope's first two Barchester novels, as the Reverend Obadiah Slope. Rickman played a wide range of roles. He played romantic leads including Colonel Brandon in Sense and Sensibility (1995) and Jamie in Truly, Madly, Deeply (1991); numerous villains in Hollywood big-budget films, including German criminal Hans Gruber in Die Hard (1988), Australian Elliot Marston opposite Tom Selleck in Quigley Down Under (1990) and the Sheriff of Nottingham in Robin Hood: Prince of Thieves (1991); and the occasional television role such as Dr. Alfred Blalock in HBO's Something the Lord Made (2004) and the "mad monk" Rasputin in the HBO biopic Rasputin: Dark Servant of Destiny (1996), for which he won a Golden Globe Award and an Emmy Award. It shouldn’t be a surprise that Alan Rickman is the only actor to make it onto this Greatest Villains list twice — he does bad deeds with such gusto. Legend has it he kept refusing the role of the Sheriff of Nottingham until it was agreed he could do whatever he liked with it — which, to Kevin Costner’s rumoured chagrin, included stealing the whole damn show. Every sneer, every eye-roll, every flourish of splenetic exasperation is a joy to behold. Whether he’s cancelling Christmas or cutting your heart out with a spoon, Rickman’s crowd-pleasing pantomime villainy is downright heroic. Rickman took issue with being typecast as a villain, even though he was known for playing "unsympathetic characters". His portrayal of Severus Snape, the potions master in the Harry Potter series (2001–2011), was dark, but the character's motivations were not clear early on. During his career, Rickman played comedic roles, including as Sir Alexander Dane/Dr. Lazarus in the sci-fi parody Galaxy Quest (1999), the angel Metatron, the voice of God, in Dogma (also 1999), Emma Thompson's character's foolish husband Harry in the British Christmas-themed romantic comedy Love Actually (2003), providing the voice of Marvin the Paranoid Android in The Hitchhiker's Guide to the Galaxy (2005) and playing the egotistical, Nobel Prize-winning father in Nobel Son (2007). Rickman was nominated for an Emmy for his work as Dr. Alfred Blalock in HBO's Something the Lord Made (2004). He also starred in the independent film Snow Cake (2006) with Sigourney Weaver and Carrie-Anne Moss, and Perfume: The Story of a Murderer (also 2006), directed by Tom Tykwer. He appeared as Judge Turpin in the critically acclaimed Tim Burton film Sweeney Todd: The Demon Barber of Fleet Street (2007) alongside Harry Potter co-stars Helena Bonham Carter and Timothy Spall. He provided the voice of Absolem the Caterpillar in Burton's film Alice in Wonderland (2010). Rickman performed onstage in Noël Coward's romantic comedy Private Lives, which transferred to Broadway after its successful run in London at the Albery Theatre and ended in September 2002; he reunited with his Les Liaisons Dangereuses co-star Lindsay Duncan and director Howard Davies in the Tony Award-winning production. Rickman's previous stage performance was in Antony and Cleopatra in 1998 as Mark Antony, with Helen Mirren as Cleopatra, in the Royal National Theatre's production at the Olivier Theatre in London, which ran from October to December 1998. Rickman appeared in Victoria Wood with All the Trimmings (2000), a Christmas special with Victoria Wood, playing an aged colonel in the battle of Waterloo who is forced to break off his engagement to Honeysuckle Weeks' character. Rickman directed The Winter Guest at London's Almeida Theatre in 1995 and the film version of the same play, released in 1997, starring Emma Thompson and her real-life mother Phyllida Law. With Katharine Viner, he compiled the play My Name Is Rachel Corrie and directed the premiere production at the Royal Court Theatre, which opened in April 2005. He won the Theatre Goers' Choice Awards for Best Director. Rickman befriended the Corrie family and earned their trust, and the show was warmly received. But the next year, its original New York production was "postponed" over the possibility of boycotts and protests from those who saw it as "anti-Israeli agit-prop". Rickman denounced "censorship born out of fear". Tony Kushner, Harold Pinter and Vanessa Redgrave, among others, criticised the decision to indefinitely delay the show. The one-woman play was put on later that year at another theatre to mixed reviews, and has since been staged at venues around the world. Rickman again appeared as Severus Snape in the final instalment in the Harry Potter series, Harry Potter and the Deathly Hallows – Part 2 (2011). Throughout the series, his portrayal of Snape garnered widespread critical acclaim. Kenneth Turan of the Los Angeles Times said Rickman "as always, makes the most lasting impression", while Peter Travers of Rolling Stone magazine called Rickman "sublime at giving us a glimpse at last into the secret nurturing heart that ... Snape masks with a sneer." In November 2011, Rickman opened in Seminar, a new play by Theresa Rebeck, at the John Golden Theatre on Broadway. 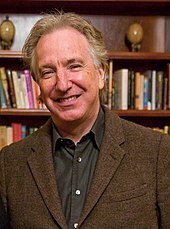 Rickman, who left the production in April, won the Broadway.com Audience Choice Award for Favorite Actor in a Play and was nominated for a Drama League Award. Rickman starred with Colin Firth and Cameron Diaz in Gambit (2012) by Michael Hoffman, a remake of the 1966 film. In 2013, he played Hilly Kristal, the founder of the East Village punk-rock club CBGB, in the CBGB film with Rupert Grint. Two researchers, a linguist and a sound engineer, found "the perfect [male] voice" to be a combination of Rickman's and Jeremy Irons' voices based on a sample of 50 voices. Rickman featured in several musical works, including a song composed by Adam Leonard entitled "Not Alan Rickman". Credited as 'A Strolling Player' in the sleeve notes, the actor played a "Master of Ceremonies" part, announcing the various instruments at the end of the first part of Mike Oldfield's Tubular Bells II (1992) on the track "The Bell". Rickman was one of the many artists who recited Shakespearian sonnets on the album When Love Speaks (2002), and also featured prominently in a music video by Texas entitled "In Demand", which premiered on Europe MTV in August 2000. In 1965, at age 19, Rickman met 18-year-old Rima Horton, who became his girlfriend and would later be a Labour Party councillor on the Kensington and Chelsea London Borough Council (1986–2006) and an economics lecturer at the nearby Kingston University. In 2015, Rickman confirmed that they had married in a private ceremony in New York City in 2012. They lived together from 1977 until Rickman's death. The two had no children. Rickman was an active patron of the research foundation Saving Faces and honorary president of the International Performers' Aid Trust, a charity that works to fight poverty amongst performing artists all over the world. When discussing politics, Rickman said he "was born a card-carrying member of the Labour Party." Rickman was the godfather of fellow actor Tom Burke. Rickman's brother, Michael, is a Conservative District Councillor in Leicestershire. In August 2015, Rickman suffered a minor stroke, which led to the diagnosis of pancreatic cancer. He revealed the fact that he had terminal cancer to only his closest confidants. On 14 January 2016, Rickman died in London at age 69. His remains were cremated on February 3, 2016 in the West London Crematorium in Kensal Green. His ashes were given to his wife, Rima Horton. His final two films, Eye in the Sky and Alice Through the Looking Glass, were dedicated to his memory. Soon after his death his fans created a memorial underneath the "Platform 9¾" sign at London King's Cross railway station. His death has been compared to that of David Bowie, a fellow English cultural figure who died at the same age as Rickman four days earlier, also from cancer kept private from the public. Tributes from Rickman's co-stars and contemporaries appeared on social media following the announcement; since his cancer was not publicly known, some—like Ralph Fiennes, who "cannot believe he is gone," and Jason Isaacs, who was "sidestepped by the awful news"—expressed their surprise. Harry Potter creator J. K. Rowling called Rickman "a magnificent actor and a wonderful man." Emma Watson wrote, "I feel so lucky to have worked and spent time with such a special man and actor. I'll really miss our conversations." Daniel Radcliffe appreciated his loyalty and support: "I'm pretty sure he came and saw everything I ever did on stage both in Britain and America. He didn't have to do that." Evanna Lynch said it was scary to bump into Rickman in character as Snape, but "he was so kind and generous in the moments he wasn't Snaping about." Rupert Grint said, "even though he has gone I will always hear his voice." 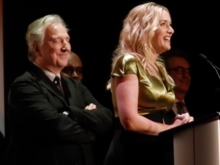 Kate Winslet, who gave a tearful tribute at the London Film Critics' Circle Awards, remembered Rickman as warm and generous, adding, "And that voice! Oh, that voice." Dame Helen Mirren said his voice "could suggest honey or a hidden stiletto blade." Emma Thompson remembered "the intransigence which made him the great artist he was—his ineffable and cynical wit, the clarity with which he saw most things, including me ... I learned a lot from him." Colin Firth told The Hollywood Reporter that, as an actor, Rickman had been a mentor. John McTiernan, director of Die Hard, said Rickman was the antithesis of the villainous roles for which he was most famous on screen. Sir Ian McKellen wrote, "behind [Rickman's] mournful face, which was just as beautiful when wracked with mirth, there was a super-active spirit, questing and achieving, a super-hero, unassuming but deadly effective." Writer/Director Kevin Smith told a tearful 10-minute story about Rickman on his Hollywood Babble On podcast. Rickman's family offered their thanks "for the messages of condolence." ^ a b Itzkoff, Dave; Rogers, Katie (14 January 2016). "Alan Rickman, Watchable Villain in Harry Potter and Die Hard, Dies at 69". The New York Times. Archived from the original on 14 December 2016. Retrieved 7 December 2016. ^ "Alan Rickmman, Harry Potter and Die Hard actor, dies aged 69". BBC News. 14 January 2016. Archived from the original on 20 November 2016. Retrieved 20 November 2016. ^ a b Saul, Heather (15 January 2016). "Alan Rickman: British actor died from 'pancreatic cancer'". The Independent. Retrieved 23 November 2018. ^ Profile Archived 26 October 2015 at the Wayback Machine, biography.com. Retrieved 14 January 2016. ^ a b c d e f Paton, Maureen (1996). Alan Rickman: the unauthorised biography. London: Virgin. ISBN 978-1852276300. ^ a b Solway, Diane (August 1991). "Profile: Alan Rickman". European Travel and Life. Archived from the original on 6 October 2007. Retrieved 3 October 2007. ^ 1939 United Kingdom Census. 1939 Household Register. London Borough of Hammersmith and Fulham, London, England; family 4, dwelling 45, lines 11–13; 1939. Print. ^ White, Hilary A. (13 April 2015). "Alan Rickman – A working-class hero at the court of Versailles". The Irish Independent. Retrieved 14 January 2016. ^ a b Mackenzie, Suzie (3 January 1998). "Angel with Horns". The Guardian. UK. Archived from the original on 6 October 2007. Retrieved 3 October 2007. ^ "Obituary: Alan Rickman." Archived 17 July 2018 at the Wayback Machine BBC News. 14 January 2016. Retrieved 5 June. 2016. ^ "Untitled Love Actually Interview." Archived 18 September 2016 at the Wayback Machine Alan Archives. 10 November 2003. Retrieved 7 August 2016. ^ Paton, Maureen (2003). Alan Rickman: The Unauthorised Biography. Virgin Books; 2Rev Ed edition. p. 53. ISBN 978-0753507544. ^ Royal College of Art Society (12 March 2019). "Alan Rickman (1946 - 2016)". ^ "THE DEVIL IN MR RICKMAN". btinternet.com. Archived from the original on 22 April 2001. ^ The RCA Journal: The Alan Rickman Issues. Archived 5 August 2016 at the Wayback Machine It's Nice That. 15 January 2016. Retrieved 7 August 2016. ^ Child's Play: Alan Rickman's 1970 Account of Murderous Children In An Inner-London Play Park. Archived 11 August 2016 at the Wayback Machine Flashbak. 20 January 2016. Retrieved 7 August 2016. ^ "Interview: Evil Elegance". Alan-rickman.com. Archived from the original on 7 July 2011. Retrieved 9 July 2011. ^ Interview Alan Rickman Archived 20 July 2011 at the Wayback Machine, abouthp.free.fr. Retrieved 20 December 2007. ^ a b Staff (14 January 2016). "British actor Alan Rickman dies aged 69". Rte.ie. Raidió Teilifís Éireann. Archived from the original on 15 January 2016. Retrieved 14 January 2016. ^ a b Shoard, Catherine (14 January 2016). "Alan Rickman, giant of British screen and stage, dies at 70". The Guardian. London. Retrieved 14 January 2016. ^ Rich, Frank (1 May 1987). "Stage: Carnal abandon in Les Liaisons Dangereuses". The New York Times. Retrieved 16 January 2016. ^ Brooks, Katherine (14 January 2016). "Alan Rickman Was A Great Film Actor, But He Was A Master of Theater First". The Huffington Post. Archived from the original on 15 January 2016. Retrieved 16 January 2016. ^ "Alan Rickman". Television Academy. Archived from the original on 17 October 2012. Retrieved 26 December 2011. ^ "Alan Rickman: A Life in Pictures Highlights". BAFTA Guru. Archived from the original on 26 December 2015. Retrieved 13 October 2015. ^ The Screening Room's Top 10 British Villains Archived 24 February 2008 at the Wayback Machine, CNN. Retrieved 14 January 2016. ^ Pop Culture News TOUGH ACTOR TO FOLLOW Archived 9 July 2008 at the Wayback Machine, Entertainment Weekly. Retrieved 14 January 2016. ^ "Alan Rickman, Obituary". The Sydney Morning Herald. 16 January 2016. Retrieved 15 January 2016. ^ Berman, Craig (16 July 2007). "Is Potter's foe, Severus Snape, good or evil?". TODAY. Archived from the original on 28 January 2016. Retrieved 15 January 2016. ^ Coveney, Michael (14 January 2016). "Alan Rickman obituary". The Guardian. London, UK. Archived from the original on 14 January 2016. Retrieved 14 January 2016. ^ "Film: Em and Phyllida keep it in the family". The Independent. 15 January 2015. Archived from the original on 5 December 2017. Retrieved 23 August 2017. ^ Bernstein, Adam (14 January 2016). "Alan Rickman, actor who brought dynamic menace to Die Hard and Harry Potter, dies at 69". The Washington Post. ISSN 0190-8286. Archived from the original on 14 January 2016. Retrieved 14 January 2016. ^ "Abbey Theatre – Amharclann na Mainistreach". Abbeytheatre.ie. Archived from the original on 16 July 2011. Retrieved 9 July 2011. ^ Staff (17 October 2010). "Stars set stage alight in Ibsen's dark tale". The Irish Independent. Retrieved 9 July 2011. ^ Singh, Anita (7 July 2011). "Daniel Radcliffe: Alan Rickman deserves Oscar nomination for Severus Snape". The Daily Telegraph. London. Archived from the original on 2 April 2013. Retrieved 10 October 2013. ^ Turan, Kenneth (13 July 2011). "Movie review: 'Harry Potter and the Deathly Hallows — Part 2'". Los Angeles Times. Archived from the original on 12 August 2011. Retrieved 13 September 2011. ^ Travers, Peter (13 July 2011). "Harry Potter and the Deathly Hallows, Part 2". Rolling Stone. Archived from the original on 14 September 2011. Retrieved 13 September 2011. ^ Schwartz, Terri (9 November 2011). "'Harry Potter and the Deathly Hallows' For Your Consideration Oscars Ad Launched". MTV. Archived from the original on 11 November 2011. Retrieved 10 November 2011. Lukac, Michael (15 July 2011). "Harry Potter: Alan Rickman Destined for Oscar Nomination?". International Business Times. Archived from the original on 9 October 2016. Retrieved 7 October 2016. ^ "Alliance of Women Film Journalists Awards 2011". Movie City News. Archived from the original on 4 January 2012. Retrieved 28 December 2011. ^ Brantley, Ben (20 November 2011). "Shredding Egos, One Semicolon at a Time – 'Seminar' by Theresa Rebeck, a review". The New York Times. Archived from the original on 24 November 2011. Retrieved 23 November 2011. ^ Brantley, Ben (15 May 2012). "Alan Rickman's Broadway.com Audience Choice Award Win Brings Back Memories of a 'Very Good Time' in Seminar". Broadway.com. Archived from the original on 18 June 2013. Retrieved 24 May 2011. ^ Brantley, Ben (24 April 2012). "2012 Drama League Award Nominations Announced!". Broadwayworld.com. Archived from the original on 26 April 2012. Retrieved 24 May 2011. ^ "A Caper by the Coens, With a Fake Monet". The New York Times. Archived from the original on 11 February 2016. Retrieved 14 January 2016. ^ Kit, Borys (12 September 2012). The New York Times (ed.). "Alan Rickman to Play CBGB Founder in Biopic". Archived from the original on 31 August 2012. Retrieved 12 September 2012. ^ Staff (14 January 2016). "Alan Rickman, 1946–2016". Royal Academy of Dramatic Art. Archived from the original on 4 March 2016. Retrieved 14 January 2016. ^ Singer, Leigh (19 February 2009). "Oscars: the best actors never to have been nominated". The Guardian. London, UK. Archived from the original on 27 September 2016. Retrieved 10 December 2016. ^ "Formula 'secret of perfect voice'". BBC News. 30 May 2008. Archived from the original on 31 July 2010. Retrieved 6 December 2010. ^ "Leonardism (2007)". Themessagetapes.com (Adam Leonard's website). 12 October 2010. Archived from the original on 11 February 2011. Retrieved 12 February 2011. ^ "Tubular Bells II". Tubular.net. Archived from the original on 11 May 2008. Retrieved 12 February 2011. ^ "Biography of Alan Rickman". Dominic Wills/Talktalk.co.uk. Archived from the original on 11 October 2012. Retrieved 12 February 2011. ^ a b c d Shoard, Catherine; Spencer, Liese; Wiegand, Chris; Groves, Nancy; Beaumont-Thomas, Ben (14 January 2016). "'We are all so devastated': acting world pays tribute to Alan Rickman". The Guardian. London. Archived from the original on 14 January 2016. Retrieved 14 January 2016. ^ McGlone, Jackie (31 July 2006). "A man for all seasons". The Scotsman. Edinburgh. Archived from the original on 9 March 2011. Retrieved 15 January 2016. ^ Chiu, Melody (23 April 2015). "Alan Rickman and Longtime Love Rima Horton Secretly Wed 3 Years Ago". People. Archived from the original on 14 January 2016. Retrieved 14 January 2016. ^ Staff (14 January 2016). "Farewell to our wonderful patron, Alan Rickman". Saving Faces. Archived from the original on 24 January 2017. Retrieved 30 November 2016. ^ Rickman, Alan. "A message from the President". IPAT. Archived from the original on 26 February 2016. Retrieved 15 January 2016. ^ Amer, Matthew (26 July 2012). "My place: Tom Burke". Official London Theatre. Archived from the original on 23 December 2015. Retrieved 15 January 2016. ^ “Councillor Michael Rickman”. harborough.gov.uk. ^ Friedman, Roger (15 January 2016). "Source: Alan Rickman Had Pancreatic Cancer, And Not For Very Long– Came to NY in December". Showbiz411. Retrieved 23 November 2018. ^ Friedman, Roger (15 January 2016). "Source: Alan Rickman Had Pancreatic Cancer, And Not For Very Long – Came to NY in December". Showbiz411. Archived from the original on 16 January 2016. Retrieved 15 January 2016. ^ Gettell, Oliver (14 January 2016). "Harry Potter fans honor Alan Rickman at Platform 9​3⁄4". Entertainment Weekly. Archived from the original on 15 January 2016. Retrieved 15 January 2016. ^ Forrester, Katy (14 January 2016). "Alan Rickman died at the same age as Bowie at 69 also after battle with cancer". Daily Mirror. Archived from the original on 27 December 2016. Retrieved 26 December 2016. ^ Cavna, Michael (15 January 2016). "David Bowie and Alan Rickman shared this one profoundly simple gift". The Washington Post. Archived from the original on 17 August 2016. Retrieved 26 December 2016. ^ a b c Park, Andrea (14 January 2016). "Stars mourn Alan Rickman on social media". CBS News. Archived from the original on 17 January 2016. Retrieved 14 January 2016. ^ Lynch, Evanna [@Evy_Lynch] (14 January 2016). "I'll also never forget how scary it was to accidentally bump into him as Snape ..." (Tweet). Retrieved 14 January 2016 – via Twitter. Lynch, Evanna [@Evy_Lynch] (14 January 2016). "Am not prepared for a world without Alan Rickman ..." (Tweet). Retrieved 14 January 2016 – via Twitter. ^ Shahrestani, Vin (18 January 2016). "Kate Winslet tearfully remembers Alan Rickman at awards". The Daily Telegraph. Archived from the original on 21 January 2016. Retrieved 21 January 2016. ^ Westbrook, Caroline (20 January 2016). "Colin Firth pays touching tribute to Alan Rickman, saying he was 'in awe' of the actor". Metro. Archived from the original on 22 January 2016. Retrieved 21 January 2016. ^ McTiernan, John (19 January 2016). "Die Hard Director John McTiernan on Alan Rickman: 'He Had a Gift for Playing Terrifying People'". The Hollywood Reporter. Archived from the original on 23 January 2016. Retrieved 21 January 2016. ^ Innes, Sheila (5 January 2016). "Thanks for the tributes". LinkedIn (Sheila Innes). Retrieved 28 July 2016. Owen, David W. (15 January 2016). "Brother is left 'broken' by Alan Rickman's death". Leicester Mercury. Archived from the original on 19 March 2016. Retrieved 5 June 2016.